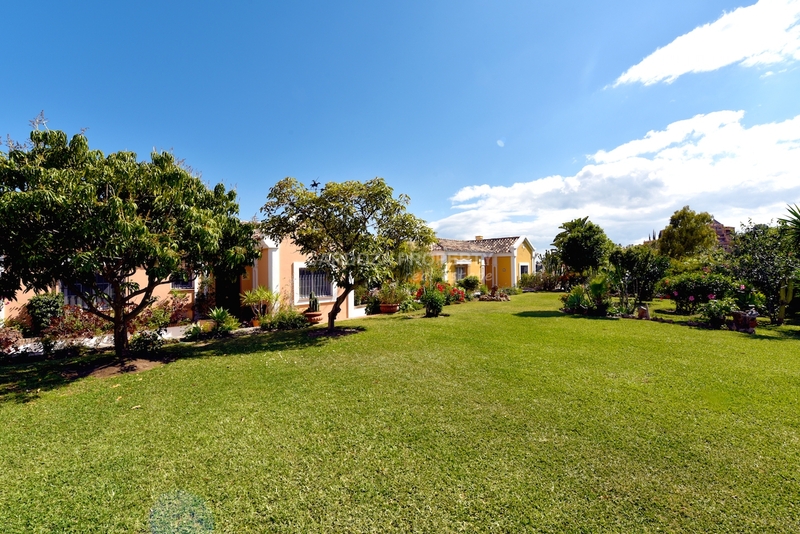 Aldea Dorada Villa. 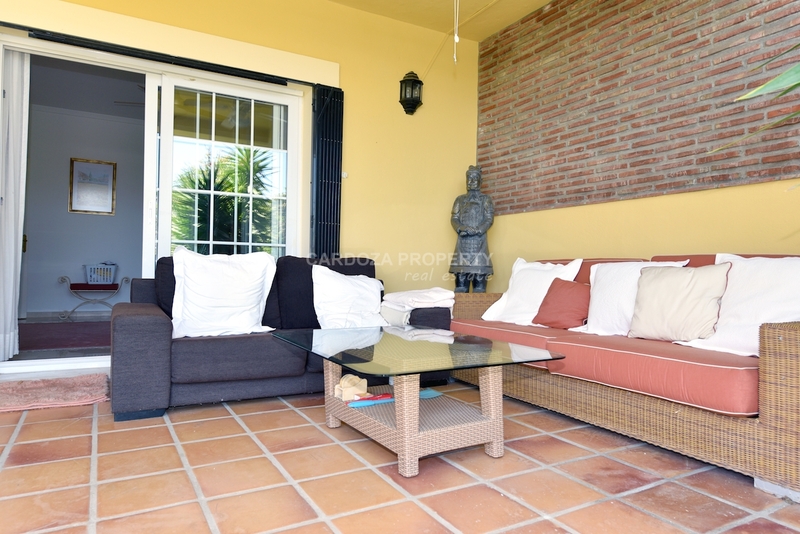 A beautiful and charming luxury villa for sale in the Gulf Valley of Nueva Andalucia. 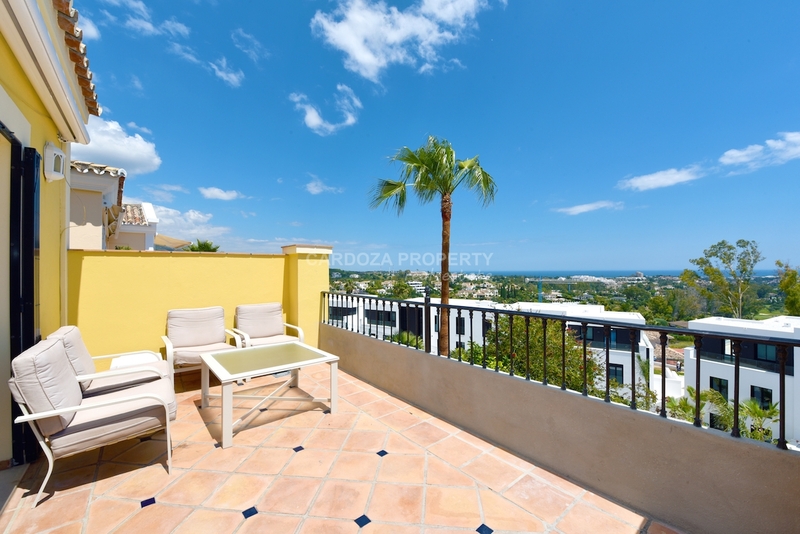 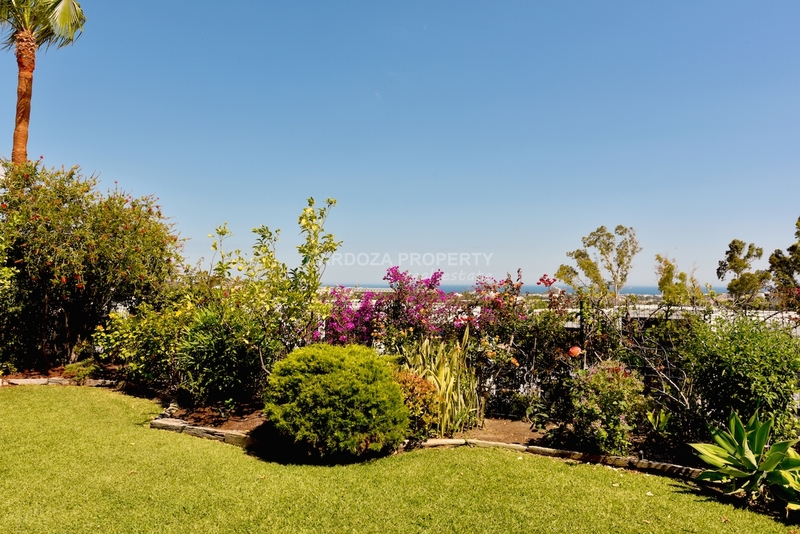 Set in a secure gated community in the hills of a very affluent area this townhouse is surrounded by fabulous views of the Mediterranean Sea. 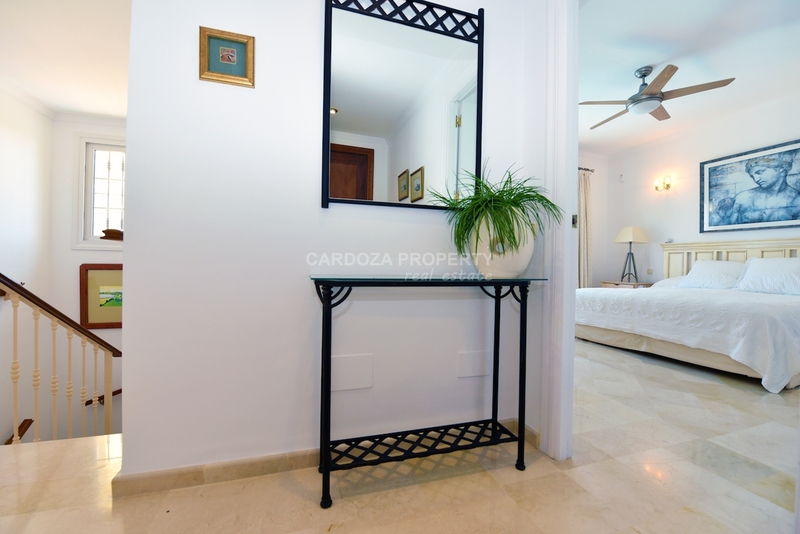 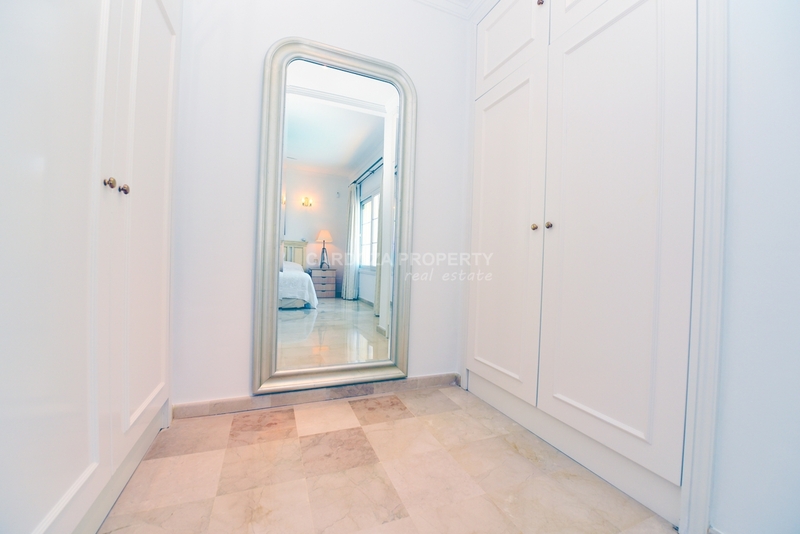 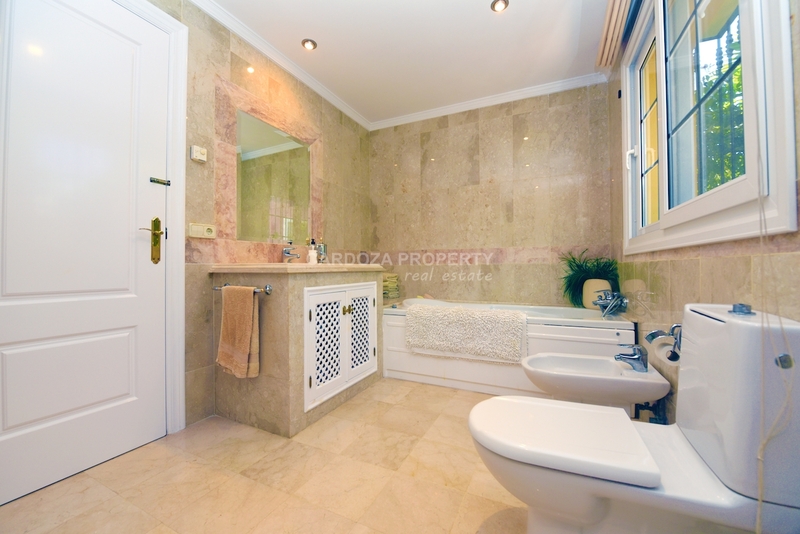 The property has a traditional style incorporating very high ceilings with large windows and marble flooring. 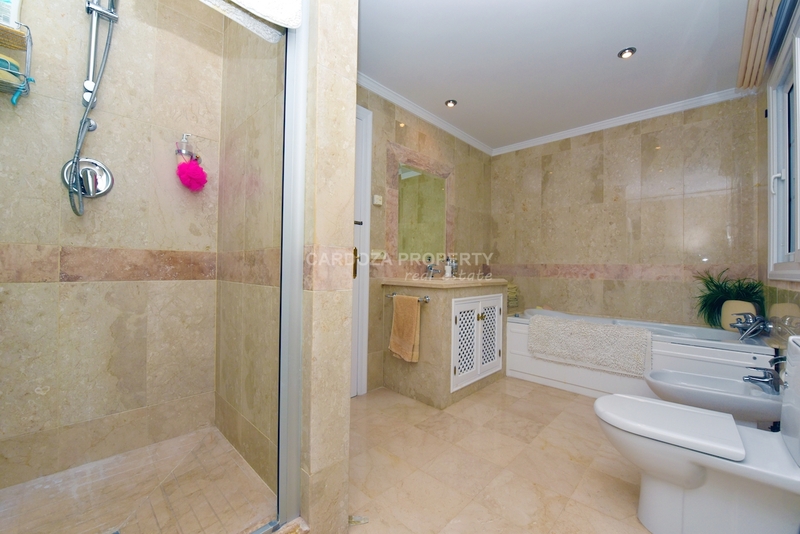 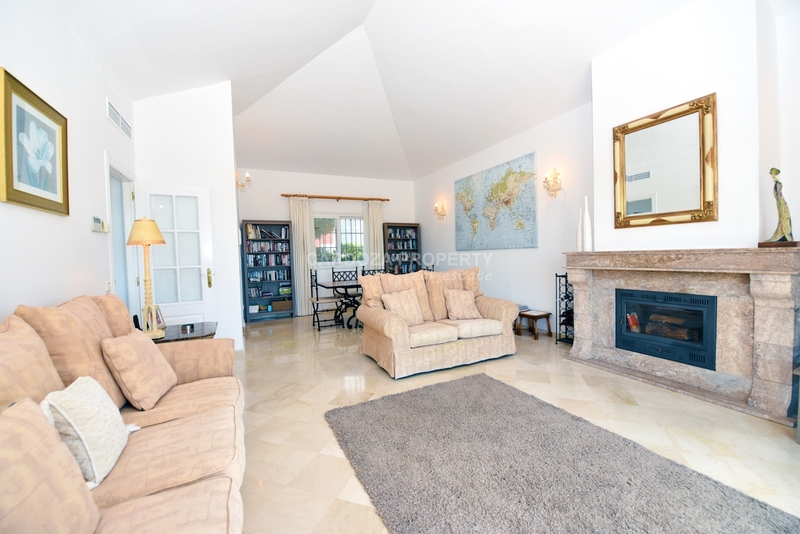 The top flooring of this property has underfloor heating throughout. 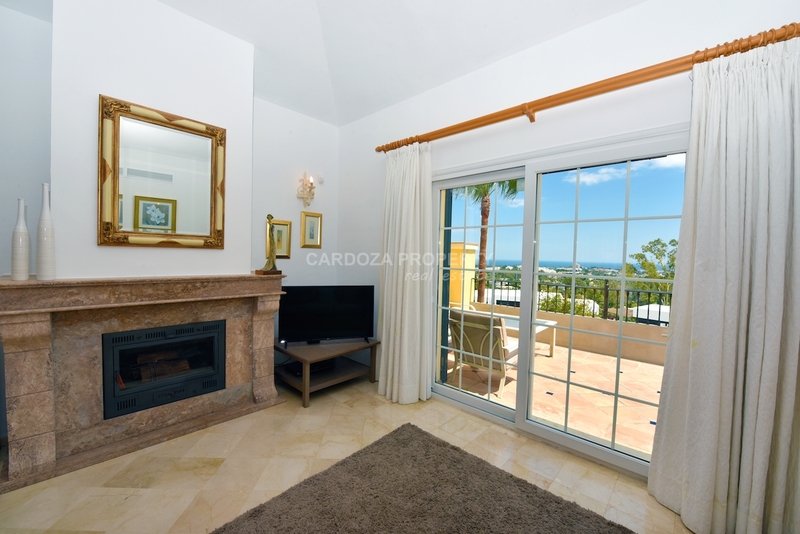 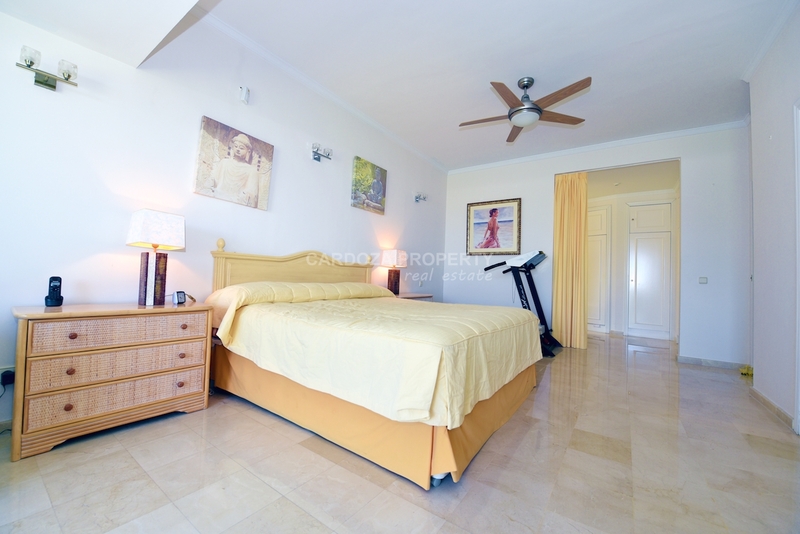 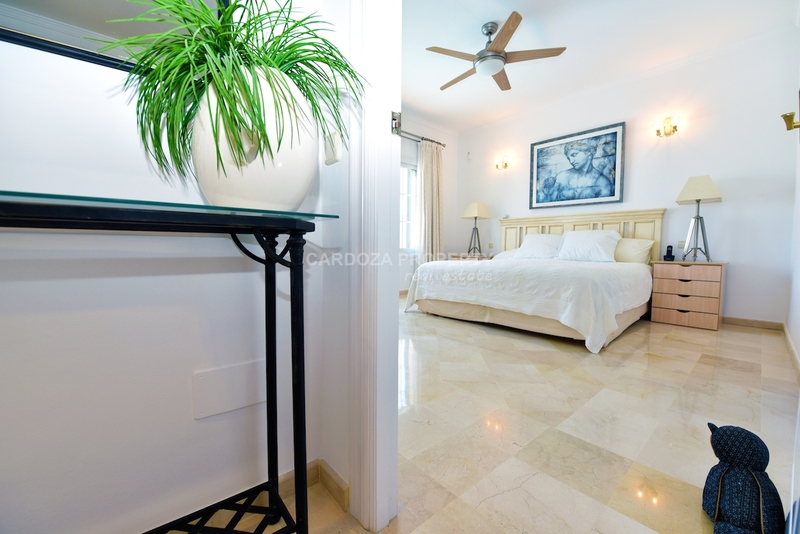 On entering the property to the right of the hallway is a very spacious double bedroom with large sliding windows overlooking the splash pool and views to towards the sea. 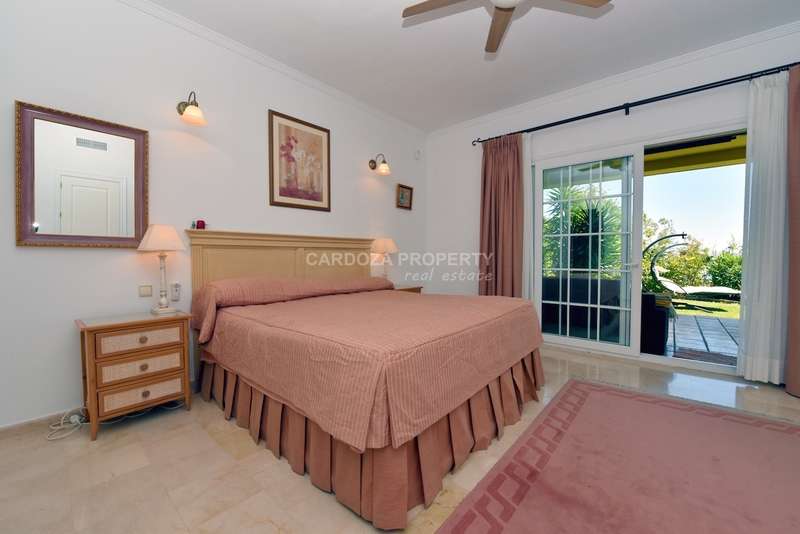 This bedroom also has an en suite bathroom and sufficient built-in wardrobe space. 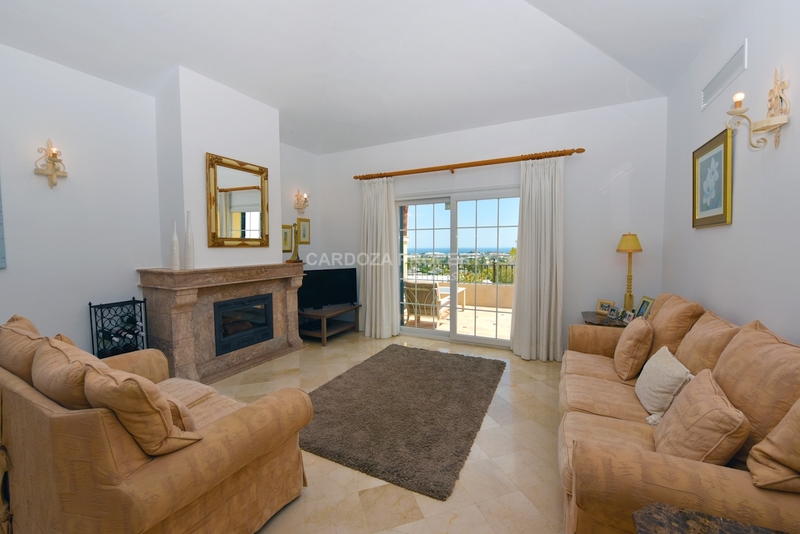 To the left of the hallway you enter into a lovely dining and lounge area with a beautiful feature fireplace. 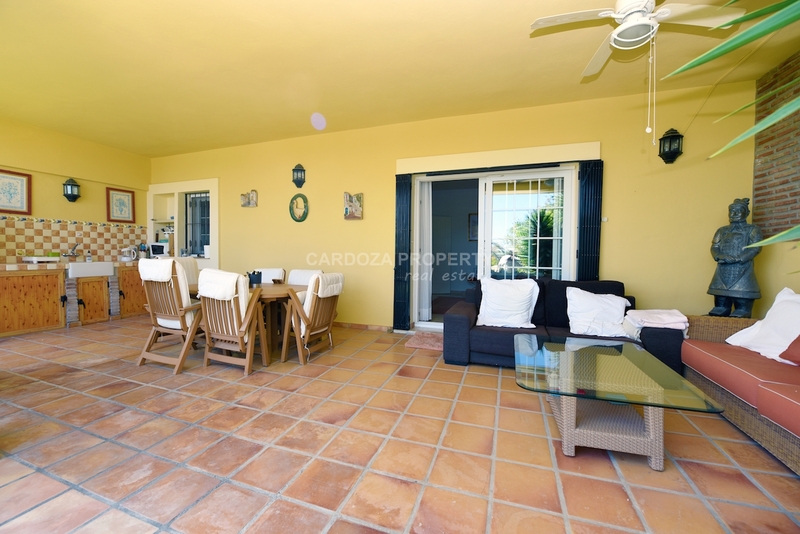 Next to the dining area is the kitchen and from the lounge you can exit onto a good size terraced area ( 103.20 m² ) through double glass sliding doors. 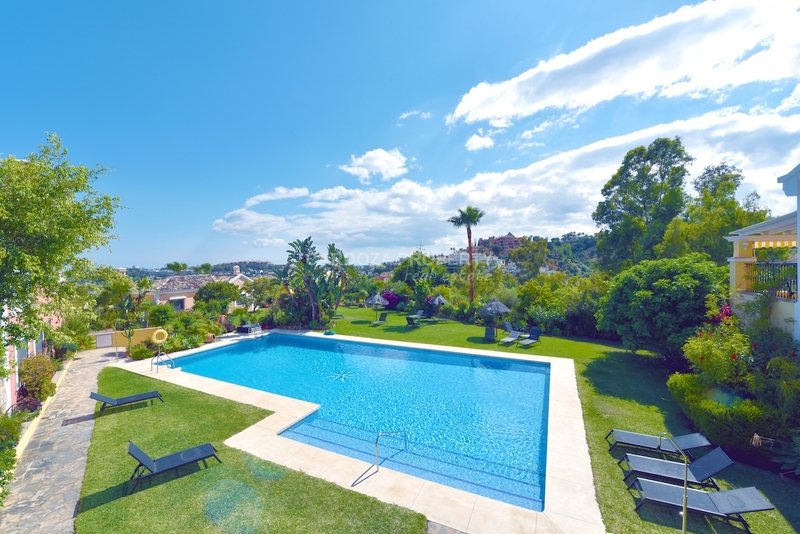 The terrace has its own splash pool and fabulous views to the open sea. 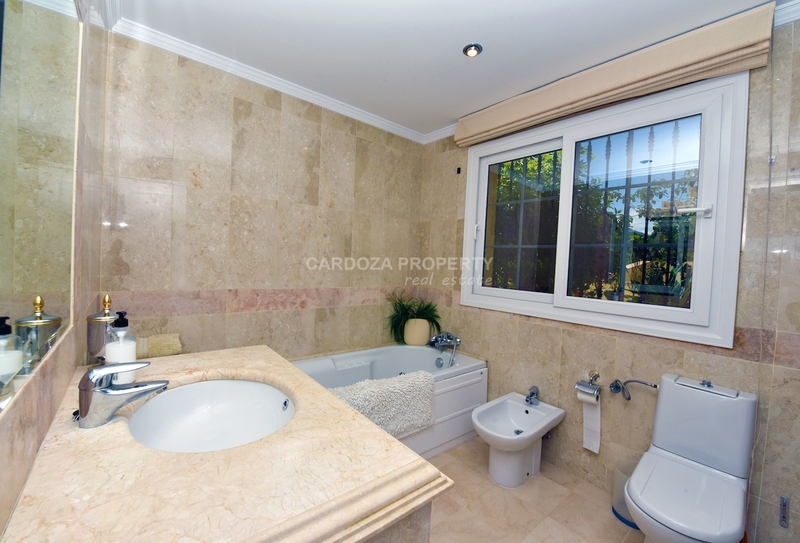 Again from the entrance and hallway you have a flight of stairs in front of you descending down to the lower level. 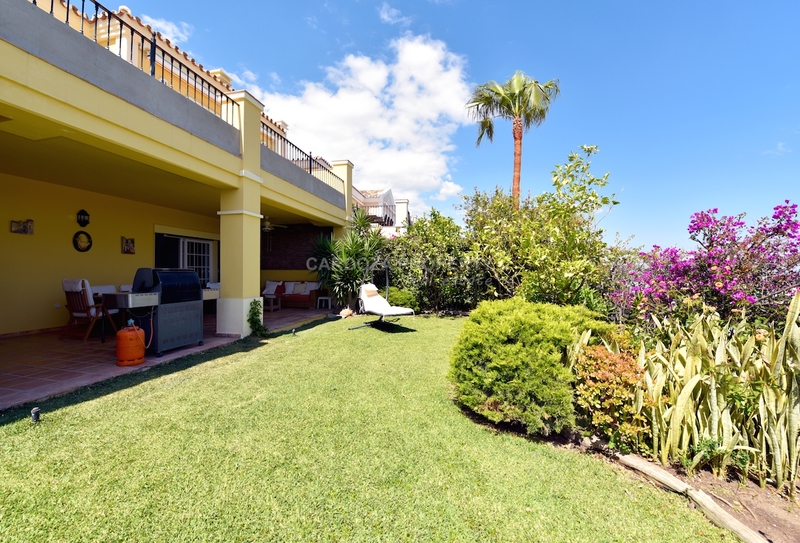 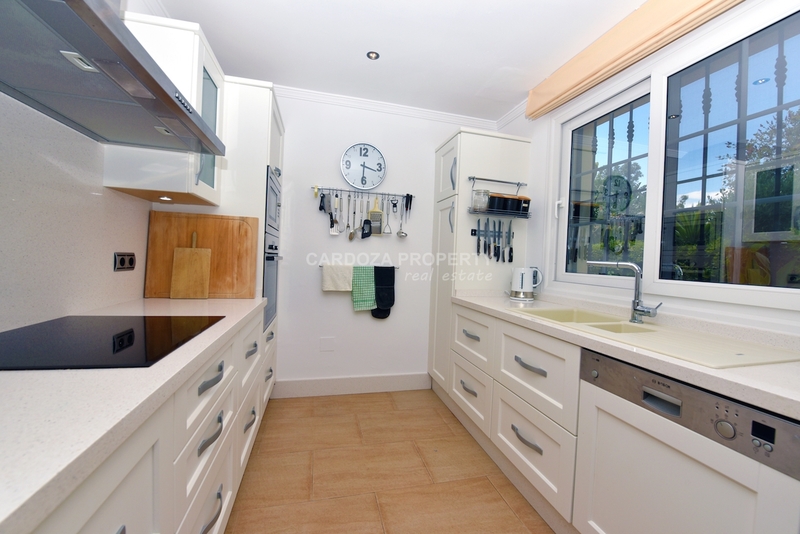 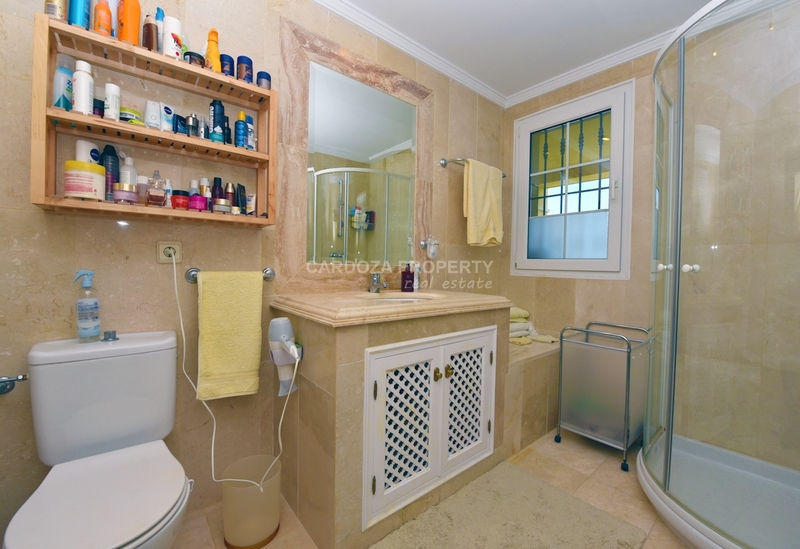 From this level straightahead at the bottom of the stairs is a guest toilet and to the right a double bedroom with an ensuite shower room, this room has access to a lovely terrace with its own kitchen for barbecues in a mature garden area totalling 128.56 m². 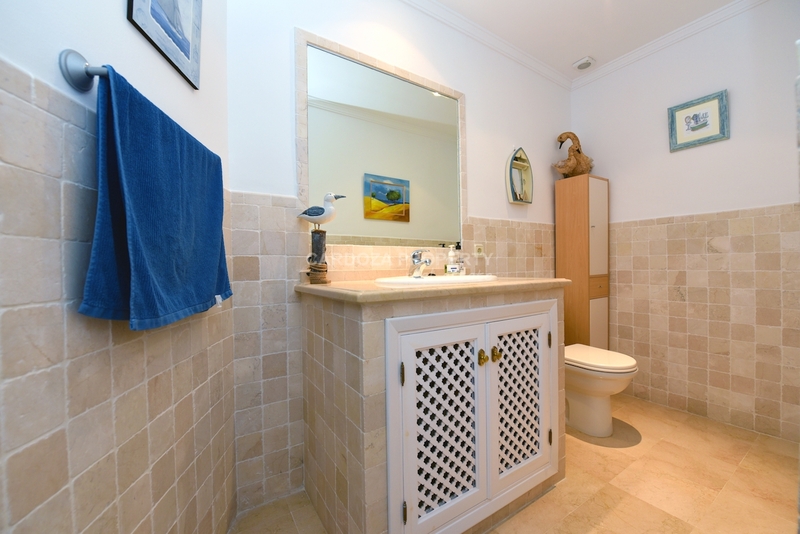 To the left of the stairs you will find the 3rd bedroom which is a large room with its own ensuite shower room, office area and a Annex area for extra guess. 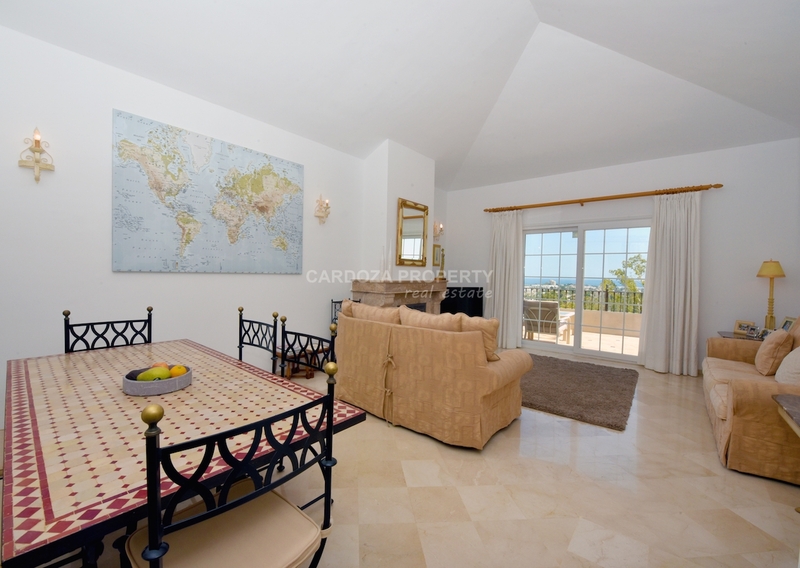 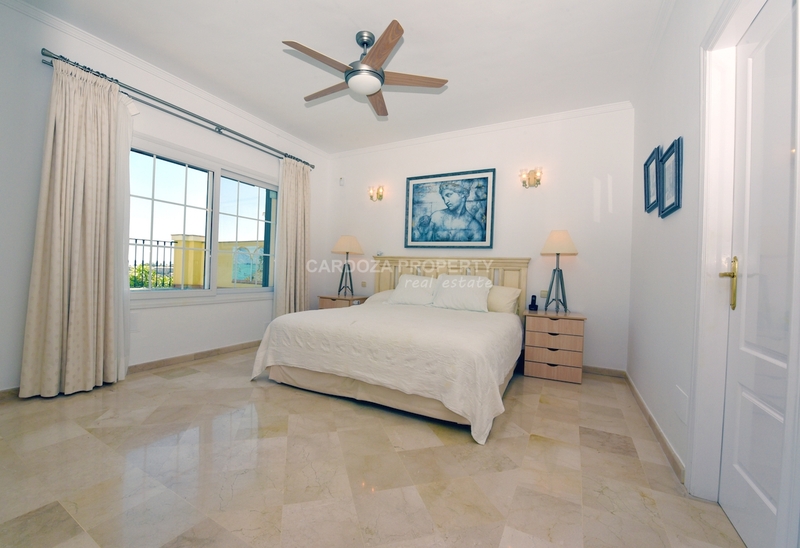 The 3rd bedroom also leads out onto the garden and terrace area which also has sea views from this level. 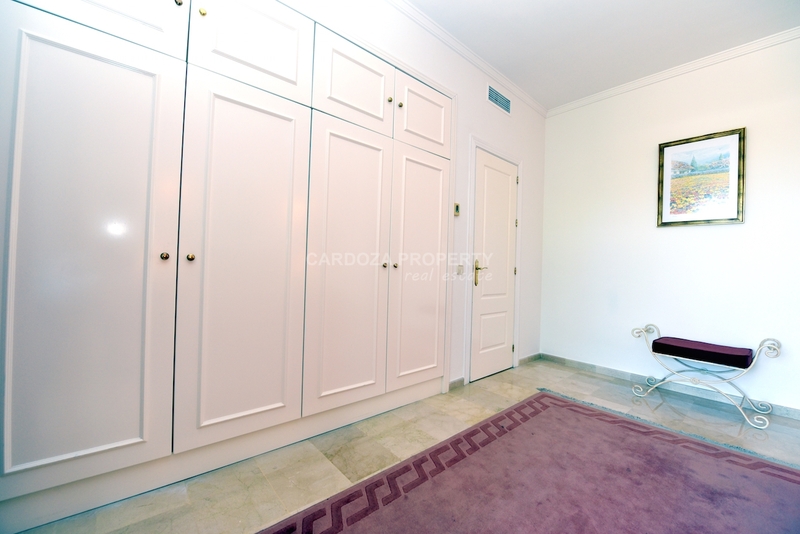 The property has a private garage for two cars and a storage room in this area. 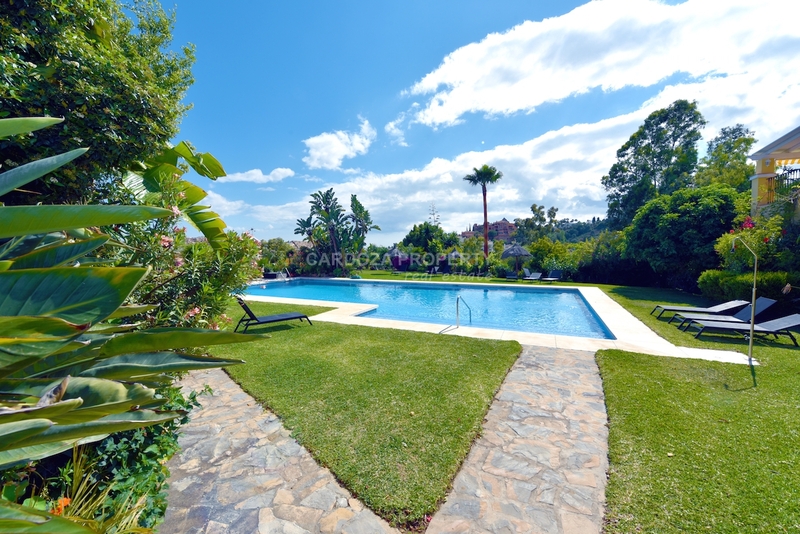 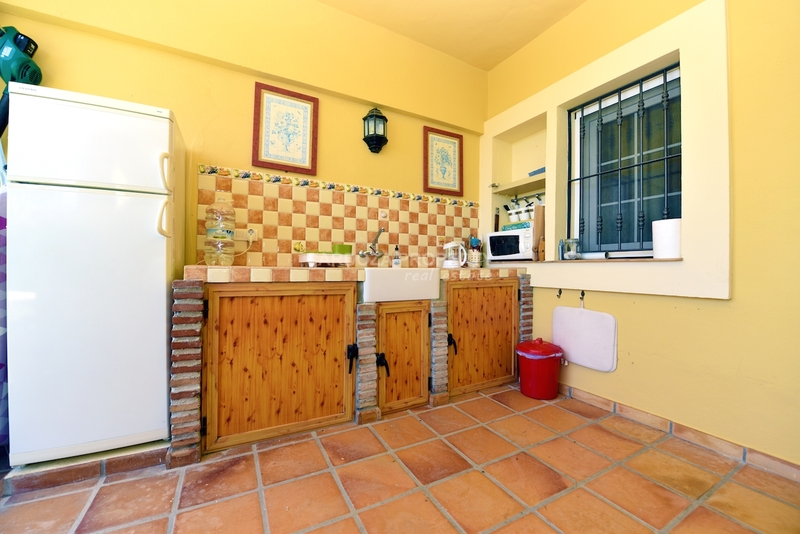 Outside the property is a large communal garden with mature trees and a good size communal swimming pool. 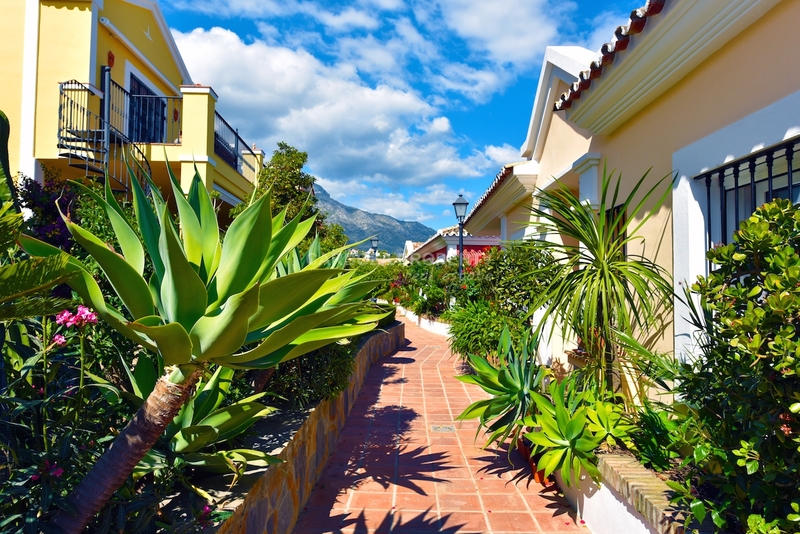 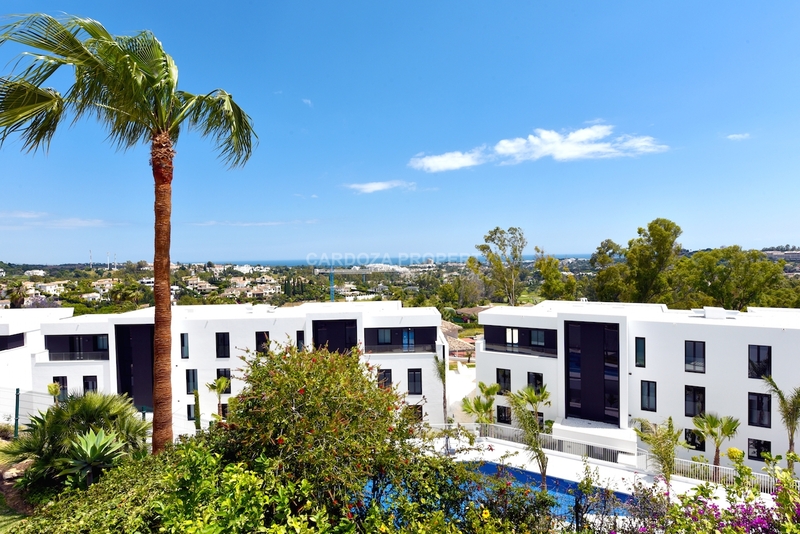 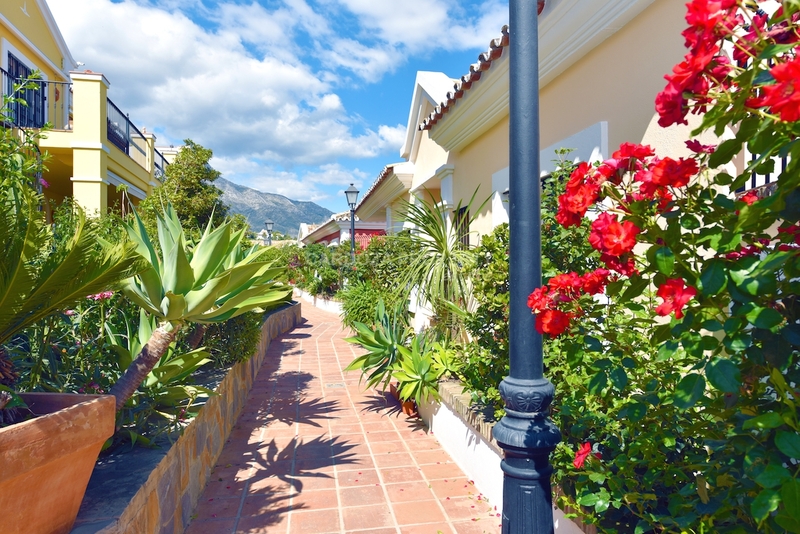 Here you are in a very tranquil and beautiful area but never more than a few minutes drive away from all amenities such as beaches, international schools, shops, designers boutiques and the glamorous and famous Puerto Banus.